Fruit — ovaries developed from the flowering parts containing seeds. They’re basically what grows where the flower was. 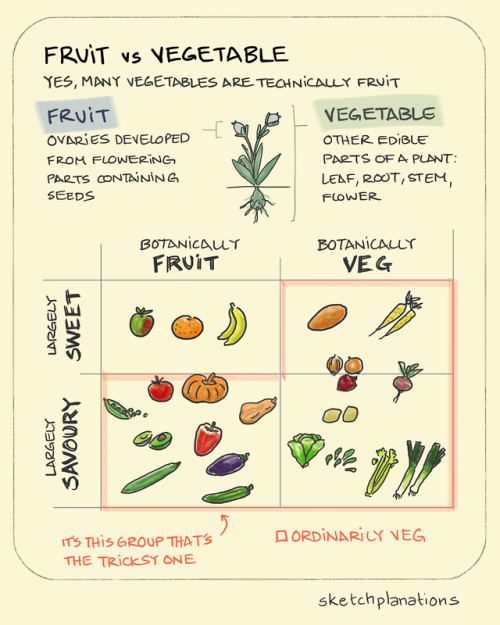 Vegetable — other edible parts of a plant. So basically, anything else, with a handy list being: leaves, roots, stems and flowers. So this makes tons of other common vegetables actually fruit, including peas, avocadoes, cucumbers, eggplants, bell peppers and more. And corn and raspberries are still rather complicated. what’s the difference between mandarins, clementines, satsumas and tangerines?